Sweet syndrome also known as acute febrile neutrophilic dermatosis includes sudden onset of painful erythematous plaques, papules or nodules, fever, histopathological finding of neutrophilic infiltrate in the dermis without leukocytoclastic vasculitis and good response to systemic corticosteroids [1-3]. Sweet syndrome may be linked to various conditions [1-3]: Hematologic malignancies including myeloproliferative disorders, solid cancers, medications, Crohn diseases, colitis ulcerative, and autoimmune diseases. The pathogenesis of Sweet syndrome is not well established but involves proinflammatory cytokines such as interleukin-1 and interferon-gamma [1,2,4,5]. Treatment with steroids is effective; Recurrences may occur when steroids are tapered or stopped. Other treatments have been reported in corticodependant cases of Sweet syndrome [1,2]: Dapsone, colchicine, azathioprine, antitumor necrosis factor drugs, thalidomide, anakinra [4,5]. We reported herein a case of Sweet syndrome related to JAK2 essential thrombocythemia with myelofibrosis successfully treated with JAK1/2 inhibitor, Ruxolitinib, and therefore elucidated a part of pathophysiology of Sweet syndrome in myeloproliferative diseases. A 66-year-old man had JAK-2 positive myeloproliferative disease (essential thrombocythemia with myelofibrosis) since 2013, he was treated with hydroxyurea. In 2015, he suffered from a long-lasting fever at 40 ℃, erythematous and painful skin lesions on his buttocks, lower limbs (Figure 1), flags of ears, and fingers (Figure 2). C-reactive protein was elevated at 200 mg/L and neutrophils count was high at 14 × 109/L. Chest and abdominal computed tomography, echocardiogram and blood cultures and no response to wide spectrum antibiotherapy excluded infectious process. No sign of leukemic transformation or disease progression was found on blood smear or on bone marrow biopsy. Deep Skin biopsy of a buttock lesion showed a dense infiltrate of neutrophils. Steroid therapy resulted in quick resolution of skin lesions, fever and inflammatory syndrome. 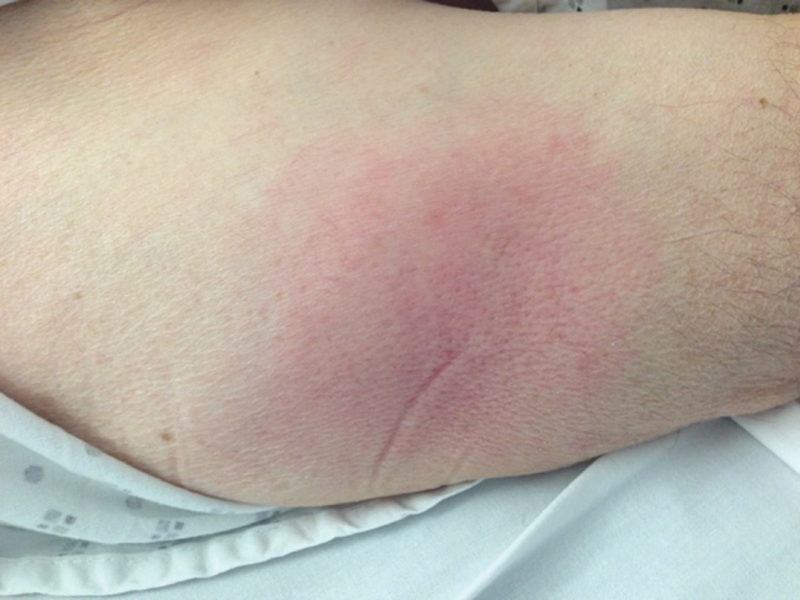 Thus diagnosis of Sweet syndrome (or acute febrile neutrophilic dermatosis) was performed. Prednisone was progressively tapered off. One month later, first relapse of Sweet syndrome occurred while prednisone was decreased to 10 mg/day and promptly resolved with methylprednisolone (120 mg/day for 3 days) relayed by prednisone 60 mg/day. Colchicine was introduced. One month later, despite prednisone (20 mg/day) and colchicine, the patient presented a second relapse of Sweet syndrome. The patient improved with methylprednisolone. Colchicine was stopped and anakinra 100 mg/day was started, prednisone was progressively tapered off. Two months later, a third relapse of Sweet syndrome occurred despite prednisone 12.5 mg/day and anakinra; It resolved with methylprednisolone. Anakinra and hydroxyurea were stopped. Ruxolitinib 10 mg × 2/day was introduced; Prednisone was progressively tapered off and definitively stopped 4 months later without any relapse during 18 months. Thereafter, despite Ruxolitinib (20 mg × 2/day), Sweet syndrome recurred parallel to disease progression to secondary acute myeloid leukemia; Steroids were resumed. Two months later, the patient died of respiratory distress syndrome related to pulmonary leukostasis. To our knowledge this is the first report of Sweet syndrome treated successfully with Ruxolitinib during 18 months in JAK2 myeloproliferative disease. Myeloproliferative diseases including myelofibrosis, polycythemia vera, and essential thrombocythemia are characterized by overactivation of JAK-STAT signaling due to JAK2V617F gain-of-function mutation or other somatic stem cell mutations (mutations in the thrombopoietin receptor gene and the calreticulin gene), which result in myeloproliferation, cell survival, and inflammatory cytokine production [6-9]. The excess of inflammatory cytokines are supposed to be the cause of constitutional symptoms in patients with myeloproliferative disease . On another side, neutrophilic dermatoses have been described in interferon-mediated autoinflammatory diseases including monogenic interferonopathies, characterized by recurrent fevers, skin manifestations, vasculopathy, cerebral calcifications, pulmonary lesions, and autoantibody production . Moreover, JAK is also the cofactor of the interferon receptor ; A study blocking IFN signaling in monogenic interferonopathies with the JAK inhibitor baricitinib showed significant improvement of symptoms, inflammatory and interferon biomarkers . Ruxolitinib, an oral JAK1/JAK2 inhibitor, that inhibits erythropoietin and thrombopoietin receptors , is used for the treatment of patients with intermediate- or high-risk myelofibrosis and patients with polycythemia vera who have had an inadequate response to hydroxyurea [6,9]. We presumed that overactivation of JAK, in our case, led not only to myeloproliferation but also to excessive interferon signaling with excess of proinflammatory cytokines production resulting in fever and neutrophilic dermatosis. Results from animal researches in myelofibrosis found out that both malignant and nonmalignant hematopoietic cells produce excess of proinflammatory cytokines and JAK inhibition reduces cytokines of both . Based on our assumption, and even though the myeloproliferative disease was under control with hydroxyurea in our patient, Ruxolitinib was used to block the JAK-STAT pathway of interferon signaling involved in acute febrile neutrophilic dermatosis and resulted in remission of Sweet syndrome during 18 months until progression to secondary myeloid leukemia occurred. Adverse events of Ruxolitinib occur mostly in the first 12 weeks of treatment. The most commonly (15-25% of patients) reported were: Ecchymosis, dizziness, headache (grade 1 or 2), diarrhea and asthenia. Hematologic adverse effects (anemia and thrombocytopenia) are dose-dependent. Isolated cases of serious infections have been reported . In France, ruxolitinib is very expansive but entirely supported by the social insurance. In summary, Sweet syndrome associated to myelop-roliferative diseases resulted from overactivation of JAK signaling and is effectively treated by JAK1/JAK2 inhibitors as long as the myeloproliferative disease is under control. We could recommend Ruxolitinb as a first-line treatment of Sweet syndrome in JAK-2 positive myeloproliferative disorder. Rochet NM, Chavan RN, Cappel MA, Wada DA, Gibson LE (2013) Sweet syndrome: Clinical presentation, associations, and response to treatment in 77 patients. J Am Acad Dermatol 69: 557-564. Wallach D, Vignon-Pennamen (2006) From acute febrile neutrophilic dermatosis to neutrophilic disease: Forty years of clinical research. J Am Acad Dermatol 55: 1066-1071. Smyth D, Selwyn J (2016) Acute febrile neutrophilic dermatosis associated with JAK-2 positive myeloproliferative disorder. BMJ Case Rep 2016. 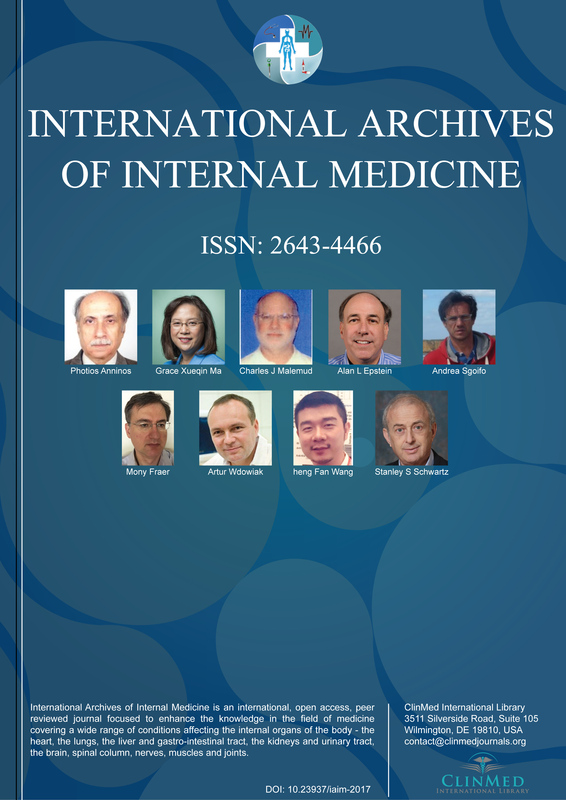 Kluger N, Gil-Bistes D, Guillot B, Bessis D (2011) Efficacy of anti-interleukin-1 receptor antagonist anakinra (Kineret®) in a case of refractory Sweet's syndrome. Dermatology 222: 123-127. Lipsker D, Perrigouard C, Foubert A, Cribier B (2010) Anakinra for difficult-to-treat neutrophilic panniculitis: IL-1 blockade as a promising treatment option for neutrophil-mediated inflammatory skin disease. Dermatology 220: 264-267. Bryan JC, Verstovsek S (2016) Overcoming treatment challenges in myelofibrosis and polycythemia vera: The role of ruxolitinib. Cancer Chemother Pharmacol 77: 1125-1142. Kralovics R, Passamonti F, Buser AS, Teo SS, Tiedt R, et al. (2005) A gain-of-function mutation of JAK2 in myeloproliferative disorders. N Engl J Med 352: 1779-1790. Kleppe M, Kwak M, Koppikar P, Riester M, Keller M, et al. (2015) JAK-STAT pathway activation in malignant and nonmalignant cells contributes to MPN pathogenesis and therapeutic response. Cancer Discov 5: 316-331. Santos FP, Verstovsek S (2014) Efficacy of ruxolitinib for myelofibrosis. Expert Opin Pharmacother 15: 1465-1473. Canna SW, Goldbach-Mansky R (2015) New monogenic autoinflammatory diseases-a clinical overview. Semin Immunopathol 37: 387-394. Hu X, Ivashkiv LB (2009) Cross-regulation of signaling pathways by interferon-gamma: Implications for immune responses and autoimmune diseases. Immunity 31: 539-550. Sanchez GAM, Reinhardt A, Ramsey S, Wittkowski H, Hashkes PJ, et al. (2018) JAK1/2 inhibition with baricitinib in the treatment of autoinflammatory interferonopathies. J Clin Invest 128: 3041-3052. S Melboucy-Belkhir, Department of Internal Medicine, Centre Hospitalier de Saint Quentin, 1 Avenue Michel de l'Hospital, 02100, Saint-Quentin, France, Fax: 33323067044.